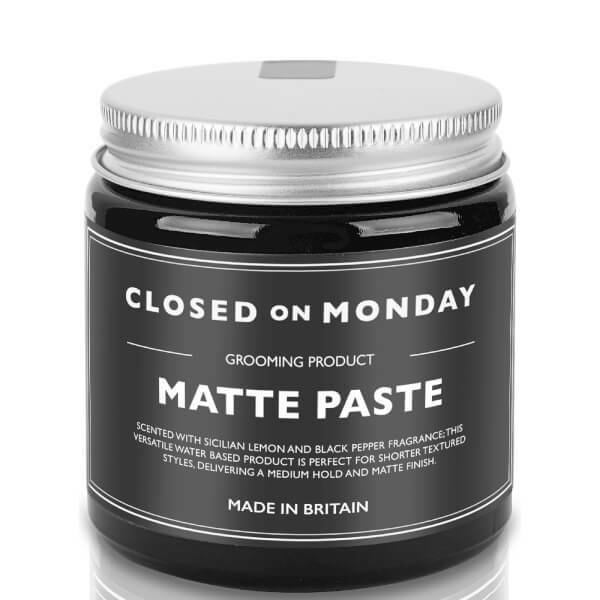 Add texture and definition with the Closed on Monday Matte Paste, a versatile water-based product that delivers a medium hold and soft matte finish. Perfect for short styles, the hair wax works to lift and tousle locks without leaving greasy residue or shine. Scented with invigorating Sicilian Lemon and Black Pepper, it locks in style all day with a malleable matte finish. This gel-wax type pomade works extremely well on dry or slightly damp hair. Once your hair is dried to the desired effect, scoop a finger of Strong Pomade and work between the palms of your hands; coating both hands and fingers. Run through your hair allowing the hair to pull the pomade from roots to tips. Aqua, Ceteareth-25,Steareth-2,Petrolatum,PVP,VP/VA Copolymer,Cera Alba, Cetyl Alcohol,Phenoxyethanol, Parfum, PN 798568. My son loves this product. Would be nice to have free delivery. The product is good for hair giving a natural non greasy finish. Delivery was quick and efficient, keeping the customer informed at all times. Excellent service. Not only does this hair product feel great, but it smells great too. It doesn't leave the hair feeling heavy or greasy, and gives a natural finish. The smell of the product is fresh, and lasts for a long time which is a big selling point. Would definitely recommend.